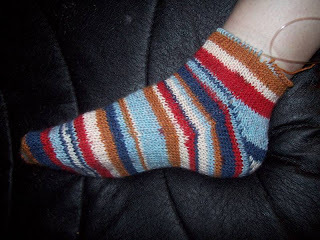 When I was looking for sock patterns, I ran across a video of Cat Bordhi demonstrating the "Magic Cast on". It was amazing! 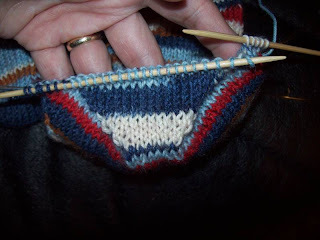 I used it for my socks and it worked great, so I decided that I would put pictures on my blog to show how it is done. 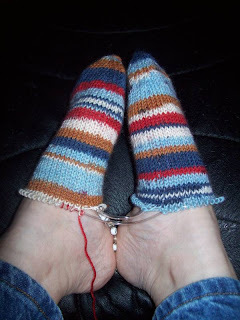 These show using 2 circulars since that is what I did with my socks. 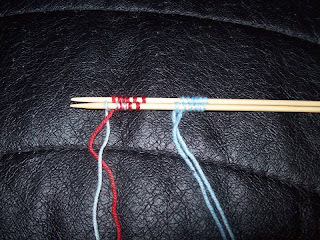 Hold the 2 needles together (for socks, put the longer one on the top as it will be used for the heels later). 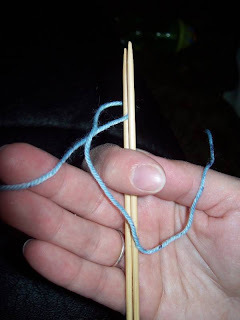 Put the yarn between the needles and up over the top. Cross the short end over the working yarn in back. 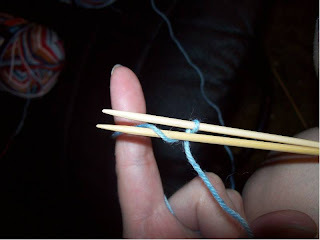 Wrap yarn around thumb and pointer as if you were doing a long tail cast on. Now you are going to add the stitches. 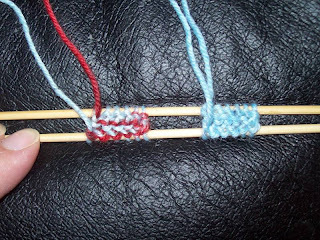 Each wrap is a cast on stitch. Bring the yarn coming off the pointer around the bottom of the lower needle and around the front and through the middle between the needles. 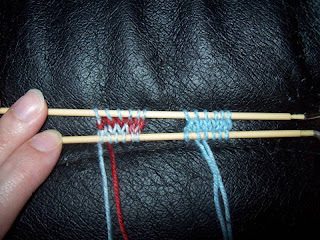 Repeat the two wraps until you have enough stitches. Then wrap the short end over the working yarn in back. 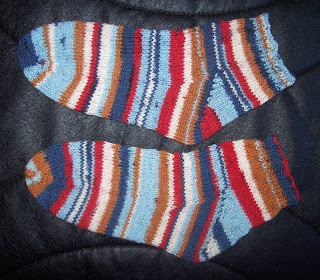 For two at once socks, slide the stitches over and do another set of cast on stitches for the 2nd sock. Make sure that the fronts are on the same side! 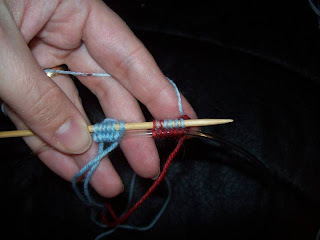 Turn the needles clockwise, so that the bottom needle is now on the top. Pull the new bottom needle through to the center of the cable. 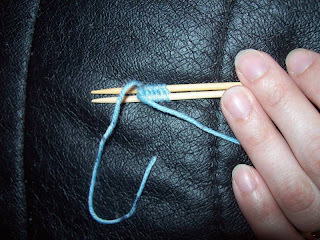 Start knitting with the other end of the circular needle on top. And here is the back. See the Purl bumps? You can't tell where the cast on is! Cool, huh?? 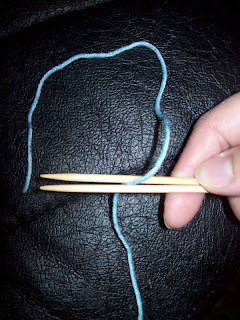 Remember - you change needles or yarn, but never both at once! 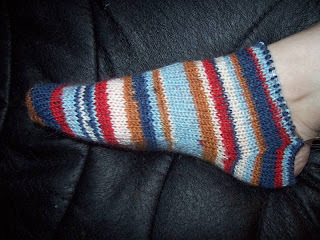 Cast on 8 stitches for each sock. 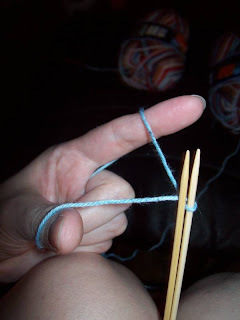 Repeat R1 & R2 until you have 26 stitches on each needle for each sock. 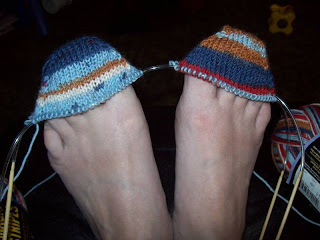 Toe increases are done and now we’re ready for the body of the sock. 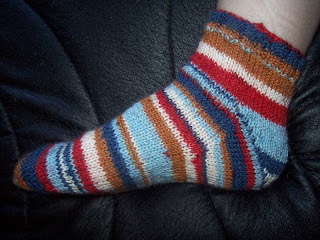 Knit around on both needles for 30 rows until sock measures 6” from the toe and the sock reaches the ankle. 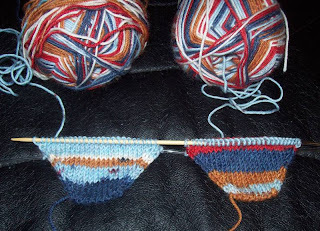 Repeat R3 & R4 until there are 46 stitches on Needle 2 for each sock. 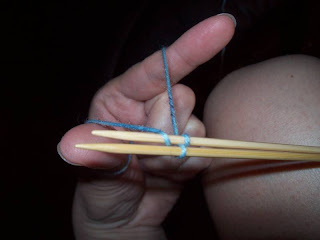 Needle 1 will rest as you knit the heels. 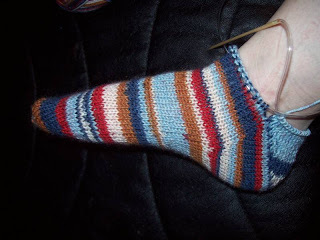 Do the 1st sock’s heel completely and then do the 2nd sock’s heel. Cast off with stretchy cast off. 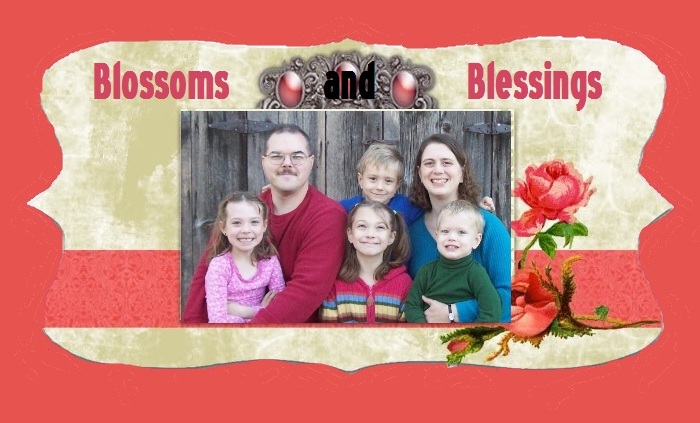 Here is how the garden looks after the end of the season last year. I used driveway markers (for winter) to mark the boundaries of the garden. Last year, I just used the dead area from the pool, and this year we squared it up. I had a volunteer crop growing! We made the garden bigger this year because I didn't have to do it by hand! We got a rototiller last week! After going in one direction, Dan went back the other direction. 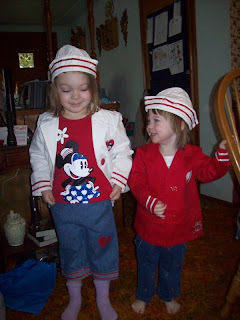 The girls wore semi-matching outfits yesterday and loved the sailor hats! Sarah helped Daddy wash the car. 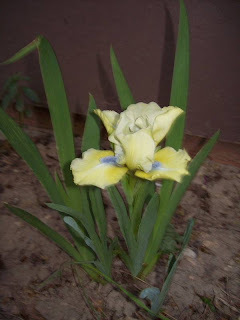 The irises are starting to bloom! We even have one that is yellow! I decided that it was time for Emily to move to her "Big Girl Bed". She only tried to get out once and then didn't try again. She did climb INTO the crib a couple times and got stuck, though! But I figured that she was old enough to have a toddler bed. Here she is all ready for her first night in her Big Girl Bed. I have always liked Lily of the Valley flowers. 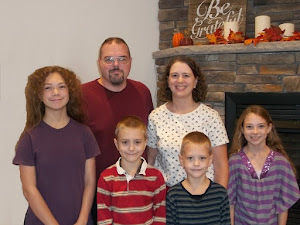 I've tried to get them to grow since we got married almost 10 years ago with little success. 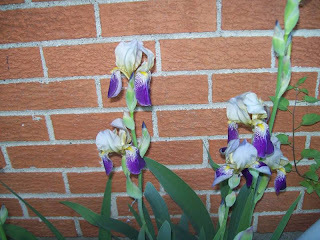 Last year, I got the plants to actually come back the year after I planted them and now this year, I have flowers!! YEAH! I also really like Violas, too, and those, I don't have a problem growing. They come back all by themselves! 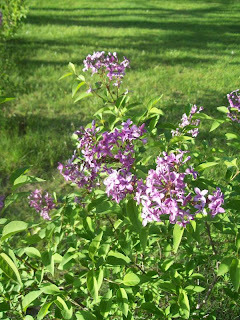 And of course, we also have these lovely yellow flowers all over the lawn! Sarah saw a package of brownies at the dollar store. I noticed that it said that it didn't need to be cooked! And then I saw that it was from Rose Art. I didn't think that brownies from a company that makes crayons and paint would taste very good, but since it was only 69¢, I figured I'd let the girls try it out! Wait 20 minutes, and pop them out! The girls seemed to like them, but I didn't taste them. 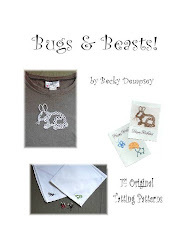 We have 2 more pouches to make, so I may give it a try next time! 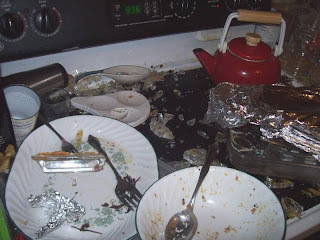 How to Avoid Doing the Dishes! I didn't get my dishwasher unloaded on Saturday and on Sunday, I was sick and wasn't up to doing anything. So I took Monday a little easier, too. Well, today, I put the teapot on to warm up some water for tea. 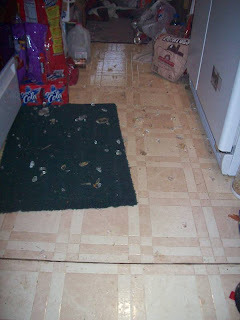 I was in the other room and heard a loud clattering sound coming from the kitchen. It sounded sort of like Legos being dumped. 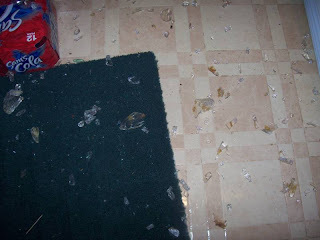 I went into the kitchen and found glass EVERYWHERE!! I had accidentally turned on the burner for the front instead of the back. 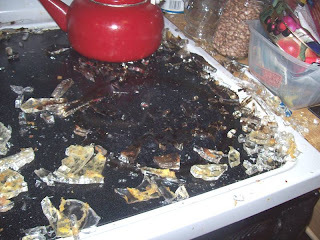 I had a stack of 2 glass cake pans (9x 13) and a 8 x8 square pan sitting in that spot. The bottom one got so hot, it exploded! So now I don't have to wash it, although I DID have to clean up the glass!